Movie Churches: The Play's the Thing Act 3 French, Godless Jimmy Stewart? The Play's the Thing Act 3 French, Godless Jimmy Stewart? 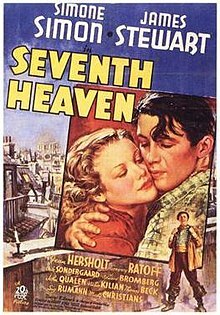 Films often rely on a suspension of disbelief -- a giant ape, a twister carrying a house to a magical land, or a man that can fly… But Jimmy Stewart as a Parisian sewer worker in 1937’s Seventh Heaven? That’s really stretching it. The film has an international cast with an interesting assortment of accents (supposedly all found in France). While Simone Simon who plays the heroine, Diane, is French, Gale Sondergaard who plays her sister, Nana, is American born. Others in the neighborhood are Aristide the Astrologer (played by J. Edward Bromberg from Romania) and Durand (played by Sig Ruman of Germany). 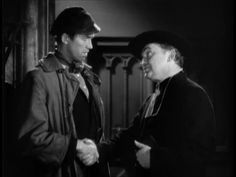 And the priest, Father Chevillion, is played by a Dane, Jean Hersholt. So I guess Jimmy Stewart’s Chico, though a Yankee, fits right in with this multicultural neighborhood. Chico considers himself “a most remarkable fellow.” One of the things that Chico considers remarkable about himself is his atheism, of which he proudly boasts. When asked why he doesn’t believe in God, he says, “Everything made me an atheist.” He explains he prayed for two things. First of all, he prayed for promotion from sewer worker to street sweep. He paid 6 francs for the biggest candle he could find and prayed in church. “I have prayed so long and so loud, that even if God was deaf he would have heard me,” he says. But no promotion came. Then he bought a candle to pray for a wife with yellow hair. “A remarkable fellow like me should have a remarkable wife.” That prayer wasn’t answered either. “God owes me 12 francs” (for the candles). One of Chico's friends hides in the church when the police are chasing him for stealing a watch. The Gendarmarie won't enter the church, but one officer says to the other, "He's got to come out sometime." As the thief skulks in the church, other people are in the pews, and the priest is conversing with the altar boys. The priest sees the thief hiding behind a pillar and says to him, “Well my son, have you come back to Mother Church? I have the whole evening, time enough to confess.” He does return the stolen watch to the priest, and ruckus outside allows him to escape by dropping down a manhole -- where he is confronted by Chico in the sewer. But Chico soon encounters that same priest, Father Chevillion. Diane, a young woman wearing a plain dress and a cross necklace, is at a table in her sister’s “cafe” with a man. She refuses the attentions of the lecherous older man and throws wine in the man’s face. Her sister is angry and drives Diane to the street and beats her. Chico steps between them, throwing Nana in the sewer. But the priest says to him, “I’ve longed to get my hands on a real atheist. We should talk on neutral ground.” So they go out on the street, where Chico tells the priest he doesn’t believe in God because of mistreated creatures like Diane. He then tells the priest that God didn’t answer his prayers for promotion or for a wife. The priest takes out a piece of paper and writes out a note for the city commissioner to promote Chico from sewer man to street sweeper. He also asks Chico to care for Diane. Obviously, the priest is taking it upon himself to answer Chico’s prayers. Father Chevillion also gives Chico two saints' medals. When Chico inspects them, he notices their price. Each is worth 6 francs. Chico becomes. When Diane is accused of vagrancy, he tells the police officer she is his wife. Most of the rest of the film focuses on the growing romance between Chico and Diane. The great obstacle to their love comes when Chico is drafted to serve in World War I, but he goes with faith. Diane had faith in God but has come to have faith in Chico as well. Chico has come to have faith in God through his relationship with Diane. The priest and the church play another role toward the end of the film. The church is a hospital for wounded soldiers, and Father Chevillion serves as their chaplain. In time, one of the men he must care for is a badly wounded Chico -- and eventually, Chico and Diane are reunited. It could be argued that Father Chevillion manipulates events to lead men to God. Or it could be said that the priest serves as God’s hand in the lives of others. 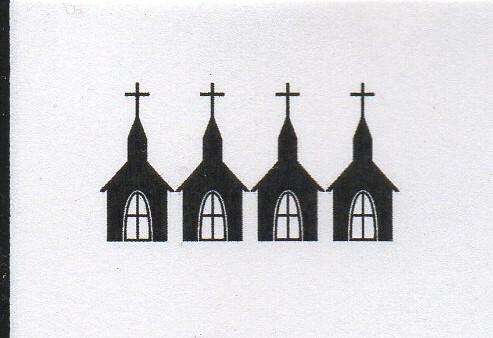 Because I believe the latter, Father Chevillion and his church receive our highest Movie Churches rating of 4 Steeples.